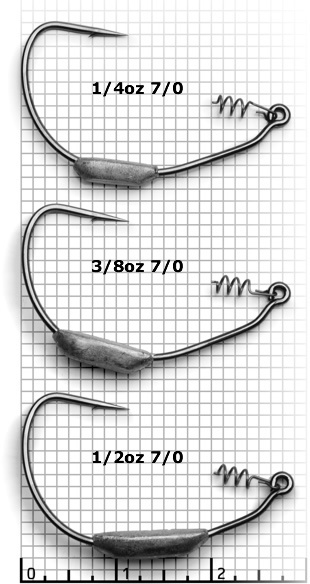 The Premium Swim Bait Hook is heavy wire with a sharp needle point. Five weights non weighted, 1/8, 3/16, 1/4 and 3/8 oz. The weight is stamped on top of each weight. The design of the lead is flat bottomed so it naturally wants the hook to stand up. The spring has a center punch that makes fastening your plastic with precision every time. 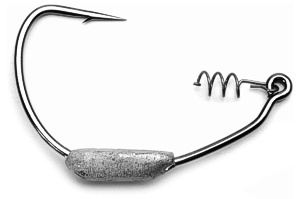 This utility hook is a staple for all tackle boxes because you can do just about everything with it. It is great for swim baits, a-rigs, craw baits or just about anything! Now also available in larger 7/0 sizes!